Many of you may recognize Richard Preston as the guru of killer diseases. His previous two books, both quite successful, dealt with the dangers of Ebola virus (The Hot Zone) and bioengineered monkey pox (The Cobra Event). 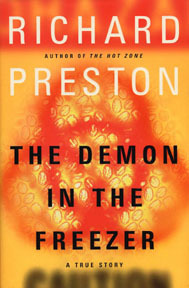 This third book in his trilogy of death, The Demon In the Freezer, is devoted to smallpox. The threat that haunts Preston is bioterrorism. A few smallpox-infected terrorists could quickly seed an explosive epidemic of this deadly virus disease. Because Russian labs working on weaponized smallpox may have leaked sample to third world countries, Prestons doomsday scenario is one that warrants more than casual consideration. We have already experienced a bioterrorism incident, the anthrax attack in the fall of 2001 carried out by an act as simple as mailing a letter. And if that isnt enough to keep you up at night, Preston ends his book with a nightmare, an account (described in the respected journal SCIENCE [January 26, 2001; vol 291:585]) of an experiment done two years ago by Australian researchers with unexpected consequences. In an attempt to reduce mouse populations in slums, they had introduced into a mild, flu-inducing mouse pox virus a human gene called interleukin-4, an immune system stimulator. Maybe the bioengineered virus would trigger sperm rejection in infected mice, they reasoned. Instead, it killed the mice, all of them, even the controls. The interleukin-4 gene simply shut down the immune system of infected individuals, leaving them so vulnerable that even flu was lethal. Imagine an influenza virus (remember, flu killed 20 million people in two years a century ago, without our help) with a terrorist-added interleukin-4 gene. Now theres a nightmare worth staying awake over.